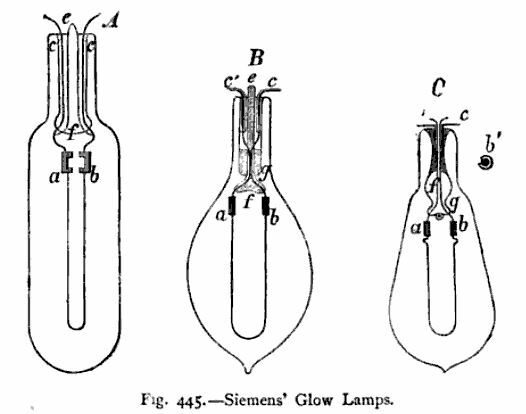 Siemens Brothers, of Charlottenburg, near Berlin , construct two kinds of glow lamps (Fig. 445, A and B). Wires having a cross section of 0.67 millimetre are used, and are fused into the glass at f. The space between f and c c is filled with plaster of Paris; a and b are clamps of sheet copper, by means of which the carbons are fastened to the wires. The carbons are produced from cotton fibres made thicker at their ends. The vessel is exhausted by means of the tube ef, which is then sealed. From four to seven platinum wires of 0.10 millimetre section are fused in the glass tube ef (Fig. 445, B), according to the intensity of the light required. The platinum wires lead to copper wires, which are soldered to the brass contacts at cc. Within the vessel the ends of the platinum wires are fastened round the thick portions a b of the carbons. The space at g is filled with powdered mica covered with plaster of Paris. This powdered mica keeps away heat from the junctions. Each of the lamps described requires a current of from 100 to 105 volts. Fig. 445, C, represents another glow lamp by Siemens and Halske. a and b are copper sockets for holding the carbon, the cross section being of the shape drawn at b. The space g f is filled, as before, with powdered mica, having a layer of plaster of Paris on the top of it. At c c the copper wires touch the contact plates. The Siemens and Halske Lamp. The 16-candle 120-volt lamp is, on account of its high resistance, specially adapted to central stations, because it allows of a considerable economy in the heavy expenditure of the conductors. These lamps, as well as the 68-volt types, are chiefly intended for those installations which employ arc and glow lamps in one circuit. The latter E. M. F. must be chosen when single arc lamps (whether of 3, 6, 9, 20 or more amperes) are placed in parallel with the glow lamps; the former E. M. F. must be adopted when two arc lamps in series are to be connected in parallel with the glow lamps. The candle powers given in the above table are mere horizontal light intensities, such as are usually given in practice. 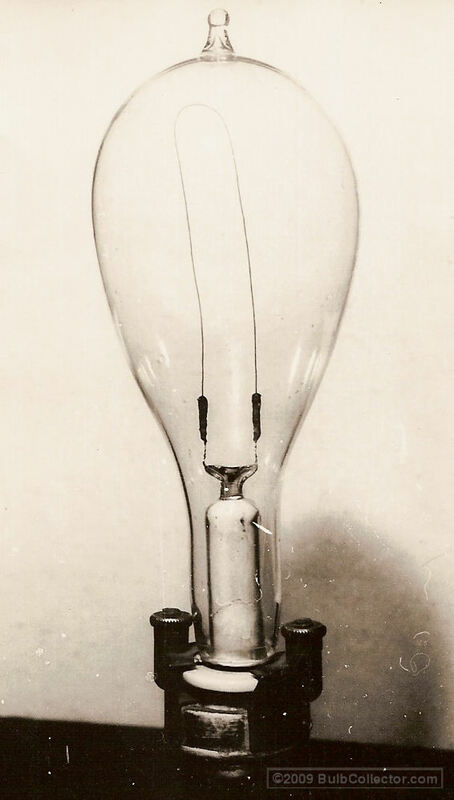 Repeated tests have confirmed the observations of the Commission of the Munich Exhibition, viz., that with lamps employing a filament of circular cross section one measurement taken at any angle about the vertical axis is sufficient; whilst with the Edison lamp, which has a filament of rectilineal cross section, two measurements ought to be taken at different angles about the vertical axis, and the mean of the two ought to be adopted. For the first measurement the lamp is generally adjusted in such a way that the two halves of the filament nearly cover each other; whilst for the second measurement the plane of the filament is placed nearly perpendicular to the axis of the photometer.